One of the most famous British artists, Carrie Reichardt places her work somewhere between craft and activism. 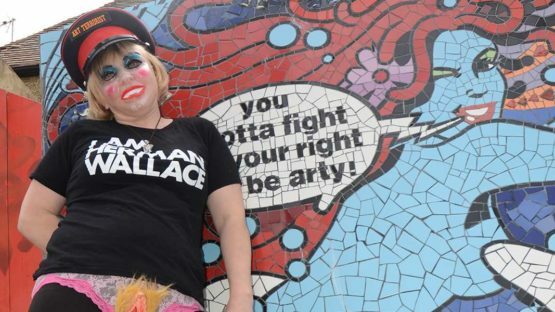 Highly interested in the social, economic and political issues ranging from unjust imprisonment to new colonial wars, she has become one of the most prominent faces in the Craftivism movement. Founded in 2003 by writer Betsy Greer, craftivism joined the separate spheres of craft and activism, allowing Reichardt to show the full potential of her expression. Sometimes, it can be rather difficult to categorize her work – is she an anarchic artist? Or visionary muralist? Maybe a gifted sculptor? Reichardt is not one for labels, though she does like the idea of being a craftivist. The artist was born in London and has a title of Baroness, which, only used ironically, has a somewhat connection with Russia and its last Tsar, who made her grandfather an honorary general for helping the allied forces in WWI. Reichardt trained at Kingston University and achieved a First class degree in Fine Art from Leeds Metropolitan. She was Artist in Residence at Camberwell Art College in 2009. 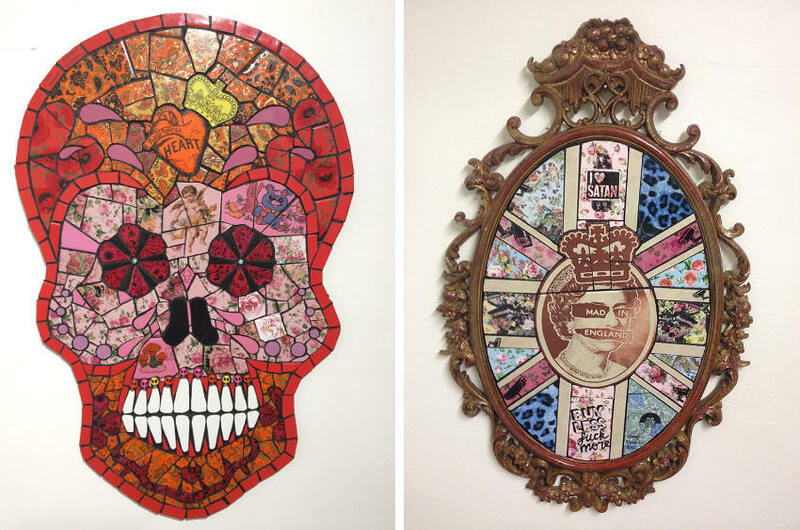 Following a period as Artist in Residence at The Single Homeless Project, she remains a proactive supporter, donating a percentage of the profits from some of her ‘Mad in England’ series to the charity. 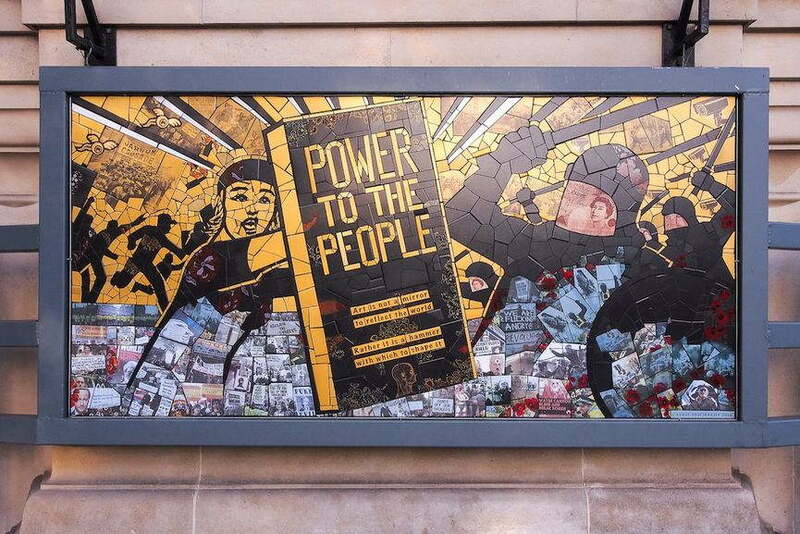 Her work has appeared in leading galleries around the world and she represented the UK as part of a group of international artists invited to mosaic the Argentinian Government building in Buenos Aires. In 2000, the Baroness was to meet her soul mate and artistic collaborator, the loving Mr Spunky. Together they decided to transform their home into a living work of art; hence The Treatment Rooms was formed. Reichardt’s work so far has been exceptional. Her craftivism (or we could label it as a protest art) feels connected with creators whose practice makes some kind of political statement rather than those creating pieces on the base of aesthetics. She enjoys others skilled creative individuals who use their skill for a reason. The exceptionality of Carrie Reichardt doesn’t come exclusively from her ideas or goals – all of them exist in order to implement a change and make this world a better place – but also from her technical process. Because she studied ceramics for about a decade and also having been learning about printing, she specializes in the transfer of the image onto a tile, finding herself in a lucky place where she can put almost any image onto any tile. It helps to put a lot of politics into her work, giving it meaning. If we’re to talk about specific pieces, several works stand out. In 2011, she was among ten creative individuals asked to take part in the Fine Form Horse Parade. It is an unusual exhibition of life-size horses and sees each artist faced with an innovative blank canvas, a resin horse, in a celebration of the 100th anniversary of the Cheltenham Festival. Carrie chose to collaborate on the project with sculptor Nick Reynolds. Together they transformed their horse into a highly crafted and politicized artwork – Dada the Trojan Horse. The horse’s head was restructured to resemble a skull, whilst the body was covered in ceramic tiles detailing the history of horses and the atrocities they have undergone at the hands of men. The Mad in England is a series of works, inspired by William Morris and the long-standing tradition of subversive ceramics in the UK. This series of affordable, subversive souvenirs countered the overwhelming patriotism of 2012 by celebrating the protestor and tapping into the opposing mood of national dissent. Mary Bamber, now permanently displayed at the Museum of Liverpool, is a life-sized ceramic-adorned figure of the revolutionary socialist. Phoolan, Reichardt’s mosaic elephant, was part of the largest ever public art event – The London Elephant Parade – that took place outside London’s Natural History Museum. For The Milan Elephant Parade, Reichardt once again collaborated with Nick Reynolds, creating an elephant inspired by the revolutionary spirit spreading across the world, which conveyed the message that ending capitalism is the only true way to save the elephant and the planet. The piece was displayed outside the Triennale de Milan Museum of Art. At one point, Reichardt stepped on a life-changing path by corresponding with an inmate, Luis Ramirez, on death row in the USA. She continued this practice by corresponding with several death row inmates and political prisoners. In 2007, she went to Texas to witness the execution of another of her friends, John Joe Ash Amador, and within an hour of his death, she had assisted Nick Reynolds of Alabama 3 in making a death mask of Amador. The artist became personally involved with the horrors of the American penal system and her working process went through a significant shift – the focus was no longer on the human body itself; now the human condition was in the center of her attention. Conceived as a mobile mosaic mausoleum and commissioned by Walk the Plank, The Tiki Love Truck was not only emotionally intense but hard to produce as well. Once conceptualized, the vibrant, Polynesian-inspired design for the piece was segmented and drawn onto separate brown paper templates. An indirect method of mosaic transfer was used, so that the tiles were temporarily fixed to the brown paper design, before being transferred to the Tiki Truck itself with a more durable adhesive. In total, the truck took a team of five skilled people three months to complete. 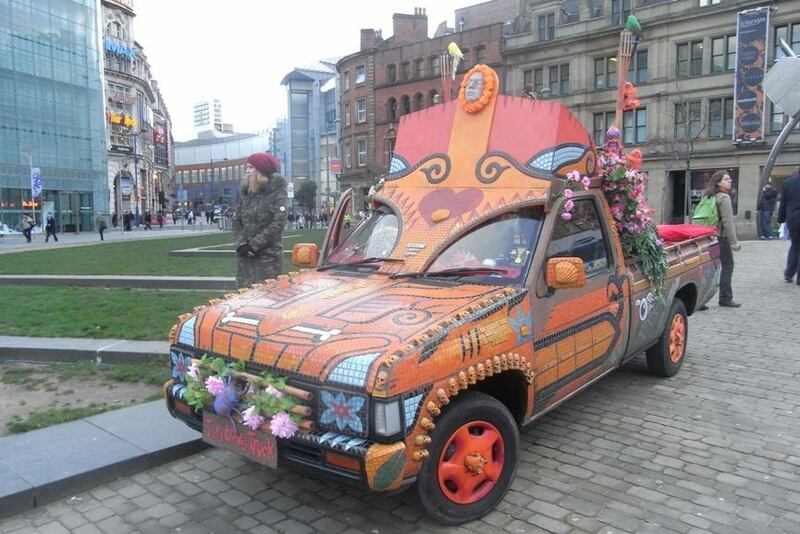 Ten days after Amador’s death, the piece carrying his death mask made its way through the streets of Manchester, as a part of the very first Art Car Parade. It was awarded The Makeover prize, for the most original or impressive applied decoration or feature. Carrie Reichardt lives and works in London.